Sara Moon had become something of a mystery. For around ten years, commencing in the mid-nineteen seventies, works such as those below were to be found framed in furniture stores, racked in poster stores and stacked in many greetings card outlets all over the world. Then, suddenly, nothing. But not just nothing. Sara Moon appeared to disappear off the face of the earth! Early in the nineteen eighties the artist moved from Red Baron in America, to Verkerke in the Netherlands and then around 1992, just disappeared. Red Baron were no longer there to ask and Verkerke just did not want to talk about the matter at all. From there, rumour and conjecture lead to various stories of Sara having been a male (possibly Iranian) who, having lost all his artworks in a fire, retired to Germany where he now lives as a recluse. Turns out this particular rumour was pretty accurate. But it wasn't the fire that drove this Persian gentleman to dismiss the business world, it was disillusionment. Now, after years with this very gallery page headed "Where are you Sara?" and in response to my dedicated Sara Moon Website and my many-hundred-strong Sara Moon Yahoo Group the artist, who's actual name is Bijan, has contacted me at last. Better still, I have met with him at his home and toured his studio, tucked away in a beautiful, small German town. The full story and photos of my day with the artist, are on the Sara Moon Website - click here to read all about it. 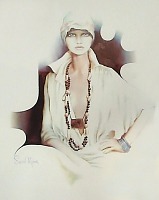 To join the Sara Moon Group, you will first be invited to join Yahoo Groups. Most people join under a pen-name and give precious little (if any) other information about themselves at all - except of course the email address they would want to be registered under. Yahoo do not bombard you with unwanted mail and within any group you may care to join you can set your own preferences for the amount of (and timing of) email you receive from that group from everything to nothing at all.